SKOPJE, Macedonia — Defense Secretary Jim Mattis on Monday condemned Russia’s efforts to use its money and influence to build opposition to an upcoming vote that could pave the way for Macedonia to join NATO, a move Moscow opposes. Mattis told reporters traveling with him to Skopje that there is "no doubt" that Moscow has been funding pro-Russian groups to defeat the referendum on a name change later this month. "They have transferred money, and they're also conducting broader influence campaigns," Mattis said. "We ought to leave the Macedonian people to make up their own minds." Macedonia wants to join NATO. It has one shot. 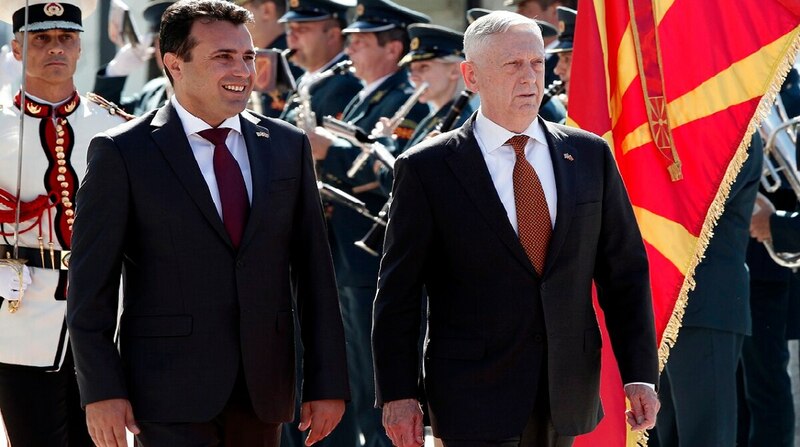 Mattis, speaking after a meeting with Prime Minister Zoran Zaev, made no mention of Russia but announced that the U.S. plans to expand its cybersecurity cooperation with Macedonia "to thwart malicious cyber activity that threatens our democracies." "There is no other alternative for the Republic of Macedonia than the integration into NATO and the EU," he said. Macedonia's main conservative opposition VMRO-DPMNE party repeated its position that "the agreement with Greece is the worst deal signed in the Macedonia's history." A pro-Russian small oppositional party, Unique Macedonia, strongly criticized Mattis' remarks on Moscow's efforts to use money to influence the opposition to defeat the referendum. 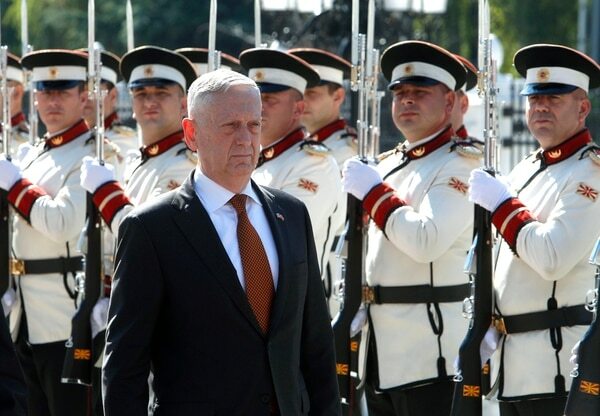 Mattis is the latest in a string of international leaders visiting Macedonia to voice support for the referendum, and he's the most senior U.S. official to visit. NATO Secretary-General Jens Stoltenberg, German chancellor Angela Merkel and Austrian chancellor Sebastian Kurz have visited and made public endorsements of the name change, saying it's critical in order for the country to join NATO after years of waiting. Mattis said he and other NATO allies "say right up front in open press what we think." "We're not passing money to people behind the scenes," he said. "We're not putting together parties that we control or try to control." Greece, a member of NATO, has for years vetoed attempts by Macedonia to join NATO, complaining about the country's name since Yugoslavia broke up in the early 1990s. Greece argues the name implies a territorial claim against the northern Greek region of Macedonia and its ancient heritage. NATO leaders in July formally invited Macedonia to begin membership talks on the condition it wouldn't become effective until the name change was implemented. But there's widespread concern about Russian impact on the vote. "There is this influence campaign to try to buy off people and try to support pro-Russian organizations," said Laura Cooper, the U.S. deputy assistant defense secretary for Russia and the region. She said she couldn't give specifics about the payoffs but said the U.S. is aware of financial support Moscow has given to pro-Russian people and groups working to undermine the referendum. Evelyn Farkas, an expert on the region who is a fellow with the Atlantic Council and a former Defense Department adviser, said Mattis' visit to the tiny nation could help sow support for the name change. "I think Mattis could make or break this thing by delivering a strong message to the opposition, which has been grudgingly quiet, that they need to come out in full-throated support, because they're not going to get another chance later," Farkas said. "He can tell them this is their last chance." Mattis also met with Macedonia President Gjorge Ivanov and Defense Minister Radmila Sekerinska. He said that he believes the Macedonian peoples' lives can be changed with added economic opportunities and security and that it's important to have those options available. The referendum vote is non-binding, and polls indicate Macedonians will likely back the deal. But even if the turnout is below the required 50 percent, if most of the people vote "yes" it will give parliament and the government a mandate to proceed. The agreement with Greece was signed in June and requires changes to the Macedonian Constitution. The final step for NATO admission is ratification by Greece's parliament, which would vote only after Macedonia completes all necessary procedures.